If the posting here is too infrequent for you, come check out my twitter, the latest craze in internet communication. I'm updating it all the time, and it even has Important Information about my preparation and ingestion of food. Like just now, I told twitter that I'm making spaghetti and meatballs. You know you want it. After getting your feet wet with twitter, you will want to check out twittervision, which tracks new tweets (those would be posts to twitter) across the globe. Ease your twittering using Firefox add-ons to post from the search box or from the address bar of your browser, or from a sidebar. If you use a Mac, download twitterific, a fantastic little widget that sits on your desktop. And as for the meatballs: 1 lb. ground chuck, a microplaned shallot, an egg, about two or three tbs matzo meal, pinches of oregano + thyme + and basil, and salt and pepper. Mix 'em up, brown 'em well, simmer in red sauce for at least half an hour, and serve with spaghetti. Don't let Mario Batali tell you not to eat meatballs with your spaghetti because that's not now how the Italians do it. This is America, baby! We eat meatballs with spaghetti here, and we gotta own it. 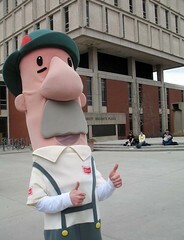 The sausages that race at Miller Park during Milwaukee Brewers games showed up on campus today. There was a sausage sale on during the lunch hour and I guess they were there to hawk the meat, though mainly they just seemed to be posing for pictures. I first noticed them horsing around through the window of the library-café Grind, where I was sitting reading a book. Everyone I saw who caught a glimpse of them instantly began to smile. The top photo is the Polish, hot dog, and bratwurst, left to right. The Italian was there too, but chorizo must have flown south for the winter. Maybe he's at spring training. 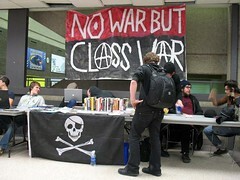 Meanwhile, a few hundred yards away, the anarchists were selling their books at half price at a table in the Union. I don't know what the Jolly Roger has to do with their cause, but it sure makes them seem badass. 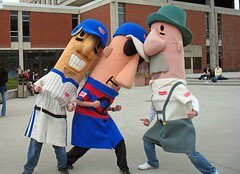 You know about the sausage race during Milwaukee Brewers games. 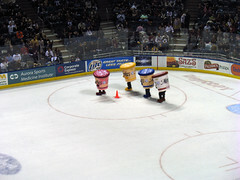 But did you know that between periods of Milwaukee Admirals (AHL) games, there is a race held in which Merk's cheese spread tubs on skates speed around the Bradley Center ice? If I'm not mistaken, the flavors are original cheddar, cheddar beer, port wine, and Swiss almond. Port wine won the race on Friday night, the Admirals beat the Hamilton (Ontario) Bulldogs 3-2 in a shootout. 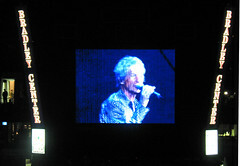 After the game, REO Speedwagon played an assortment of forgettable songs from their new album and all their 1980s hits, too. As I have said here before, it is my pleasure to live in the Dairy State.